The LEGO movie franchise has been doing fairly well up to this point, with both The LEGO Movie and this year’s The LEGO Batman Movie being fun, hilarious slices of family entertainment that always had tricks up their sleeves to keep both little ones as well as their nostalgic parents occupied. But the brick tower doesn’t seemed to have stayed firmly upright for long, with the debut of the third film in the franchise, which is based directly off the Ninjago line of toys within the LEGO brand. It is that film, entitled The LEGO Ninjago Movie, that feels exactly what a lot of people thought The LEGO Movie was originally going to be; a giant, mostly unimpressive extended toy advertisement that gets a couple of laughs, but ultimately doesn’t amount to a whole lot. 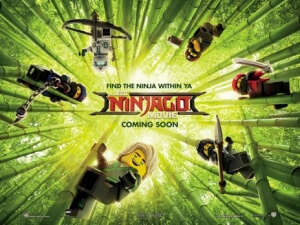 In the city of Ninjago – or at least the one imagined by Jackie Chan as a shopkeeper in the film’s live-action wraparound segments – a small group of ninjas protect it and its many citizens from the constant threat by the evil Lord Garmadon (Justin Theroux), using their giant mech suits and stylised weapons to prevent his every city-destroying move. Things are complicated, however, because the de-facto leader of the group Lloyd (Dave Franco) is also Garmadon’s son, and so he faces constant humiliation and disdain from the city for his unfortunate parentage, while also being praised for his ninja actions while in disguise. However, when Lloyd accidentally causes a much bigger threat to emerge (which, unless you’ve seen the trailers, won’t be spoiled here because it’s a pretty funny reveal), he and the rest of his ninja gang must go on a journey with their Master Wu (also Chan) to save the city, while also finding time for both Lloyd and Garmadon to finally bond as father and son. You can tell almost right away that this is a different creative team than the other LEGO movies, because a lot of the humour is much more hit-and-miss and the narrative isn’t as energetic, and as a result it feels more like a hand-me-down instead of a pure concept, without a fraction of what made the others so enjoyable. The story would be somewhat entertaining if it were more of a satire of martial arts movies, but this seems like it just is one of those films instead of actually poking fun of that genre and its many tropes, and it’s a narrative that’s been told many times before as well so it’s not exactly unpredictable where things end up going, so you’re left mostly just bored until the next recognisable plot element kicks in. It doesn’t have the luxury of having many entertaining characters either, with the large majority of them just being one-note archetypes and voiced by actors who are given absolutely nothing to do in order to stand out (for instance, until his name pops up in the credits, you wouldn’t even know that Michael Peña was in this), although Theroux gets to have a bit of fun vamping it up as the film’s main villain. Though it may not be even remotely as funny as the previous two LEGO films, and lacks the same kind of entertainment factor they had as well, there’s no mistaking that there is still some semblance of a heart somewhere in the midst of all of it. The father-and-son plot line, unoriginal though it may be, does have some nice scenes that help expand their relationship, and the resolution is certainly heart-warming if you’ve stuck around long enough to see it play out. It certainly has way more heart to it than something like The Emoji Movie, and despite being a clear cash-grab for the LEGO brand there is still a fair amount of effort and dedication put into the animation, which remains as pretty and even playful as before. As a family movie, it’s certainly not the best one out there at the moment, but it’s still fine enough for young children to enjoy, and there are one or two things that parents will appreciate about it too. If you’re going along expecting it to be just as good as The LEGO Movie or The LEGO Batman Movie, then prepare yourself for a massive disappointment; it’s nowhere near as fresh or entertaining, but as a mere distraction for the young’uns, then there are definitely worse examples to expose them to. The LEGO Ninjago Movie lacks the freshness and enjoyable nature of the previous two theatrical LEGO movies, but there is still some semblance of a heart in the machine, which doesn’t exactly make it a great film but certainly puts it above many of the other examples of clear cash-grabs made for family audiences and their wallets.